An emergency dismount is something every rider should know how to do. 1. Take both feet out of the stirrups. This is really important, because it's easy for a foot to get caught otherwise. 2. Put the reins in your right hand. 3. Place both your hands on the horse's withers. 4. Lean forward so that your weight is over your hands. 5. Kick your right foot back and over your horses rump. 6. Push off the horse with your hands. 7. Land on both feet with your knees bent to absorb the impact. 8. If your horse was moving quickly, you may need to jog a few steps with him to keep your balance. 9. Continue to hold the reins so you have control over your horse. To practice this, have a helper hold your horse at the halt and practice the movement a few times. Next have the helper walk your horse and practice the emergency dismount at the walk. Once you are comfortable try doing the movement on your own. Eventually you'll be able to do an emergency dismount at the trot and canter too. Remember, typically it is better if you can stay with your horse and ride out situations, but an emergency dismount is a good tool to have just in case. When a horse is traveling straight and balanced (like Horse B), we want our aids to remain even on both sides so that we, as riders, do not interfere and cause the horse to travel crooked. Bending is a term we use to ask a horse to be straight (balanced) when on a curve. This means that the horse's spine follows the curve. Sometime this is referred to as lateral flexion. To ask your horse to bend to the left (just like Horse A) follow these tips. Your hips should be inline with the horse's hips, and your shoulders and hands inline with the horse's shoulders. Your inside leg (left leg) should be at the girth, and your outside leg (right leg) just a little bit behind the girth. Think of the inside leg as a pole that the horse is bending around. It controls the shoulders so that the horse doesn't become unbalanced and drop his shoulder to the inside. The outside leg controls the hauches. It doesn't allow the haunches to swing out and instead keeps them on the circle. With your elbows at your side, twist your torso slightly to allow your shoulders to turn with the circle and allow you to see where you are going. This will position your hands so that the inside hand (left hand) is slightly behind the other. If you pull too much with the inside hand, then only the neck will bend and not the spine. When only the neck is bent, it is easy for the horse to evade your aids and not turn at all. Think about steering his withers instead of his nose. Notice how we are not pulling the horse's nose around, instead we are guiding his entire body. Your seat moves in rhythm with the horses gate, whether at the walk, trot, or canter. To ask your horse to bend to the right (just like Horse C) switch sides. Your right leg and hand are now the inside aids, and your left leg and hand are the outside aids. Remember, carrying a rider is not something a horse automatically knows how to do. Whether in the show ring or on the trail, It is the rider's job to help him stay balanced. Once you and your horse are balanced and straight (actually traveling a straight line or an arc) you will be able to ask for more advanced movements and your horse will be prepared to perform them. Pony club teaches a basic balanced position as the foundation for riding. A basic balanced position is one where the ear - shoulder - hip - heel are all in alignment. 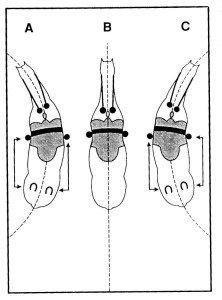 This balanced position allows the rider to be more effective in the use of aids and have better control of gaits. Because the rider is balanced on the horse and with the horse's movement the two are able to have a relaxed partnership instead of impeding each other. Your back should be straight with your core engaged. Try not to slouch forward or hollow your back. This will rotate your pelvis and make your seat less effective. Rotate you shoulders back and keep your eyes up and looking ahead of you. There should be a straight line from your elbows to your wrist and down the reins to the bit. Elbows should be softly bent and hanging vertically from your shoulders. Reins can be shortened or lengthened to achieve the optimum contact with your horse while still maintaining good position. Hands should be soft and steady to avoid jerking on your horse's mouth.